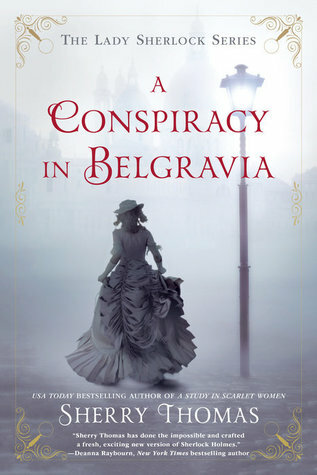 As I said in my review of A Study in Scarlet Women, I immediately put A Conspiracy in Belgravia on hold at the library. Luckily for me, I was first on the hold list, and I was able to pick it up only two days later. As soon as I got home, I started reading it and found myself completely absorbed in the world of Charlotte Holmes once again. A Conspiracy in Belgravia picks up right where A Study in Scarlet Women left off. Livia, Charlotte’s sister, attempts to write a good Sherlock Holmes story, but is still struggling with Charlotte’s scandal and has to adjust to life at home without her. The main mystery throughout A Conspiracy in Belgravia is Lady Ingram’s note to Sherlock about her former boyfriend, who happens to be Charlotte’s illegitimate half-brother. Mrs. Watson is reluctant to take on this investigation since it would hurt Lord Ingram, but Charlotte is adamant about figuring it out. Lord Bancroft, Lord Ingram’s brother, proposed to Charlotte several years ago, and she refused. Now he proposes again, and while Charlotte wants to refuse again, he presents her with some ciphers for her to decode, so she can exercise her married brain without the whole Sherlock nonsense. However, as Charlotte begins figuring out these ciphers, a murder turns up as a result, so Bancroft brings Charlotte into help the Crown with its investigation. Bancroft and Ingram both work for the Crown; I feel like they are an early version of MI5. The difference between Lord Ingram and Lord Bancroft is pretty noticeable. They are technically half-brothers since Lord Ingram’s mother had an affair with a Jewish banker. However alike in personality Lord Bancroft and Charlotte are, it is Lord Ingram who is the one that actually gets Charlotte. I cannot wait to read the third book, The Hollow of Fear, to see how Lord Ingram and Charlotte continue their friendship; fingers crossed for maybe a romance! As I have been reading this series, I am constantly floored by how timely some of these passages are. Even though this series takes place in the 1880s, unfortunately some things just haven’t changed. But I am all for reading books where women are bucking the patriarchy at a time when they had virtually no rights. If you too enjoy that, definitely pick up the Lady Sherlock series. I seriously cannot say enough good things about this series. Sherry Thomas is most well-known for her romance novels, and after reading the Lady Sherlock series, I definitely want to give her romances a try. I thoroughly enjoyed A Conspiracy in Belgravia and give it 4 stars. The only reason it did not get 5 stars from me was because I think there was a tad too much going on with the different mysteries, and it was a bit difficult to keep track of everything. But I still loved it! If I can only recommend one book to all my friends for the next few months, I would cheat and recommend the whole series because these books are just that wonderful. What other mystery series do you love?